What's happening in the forest sector? The arrival of spring (finally!) reminds us of the restorative power of nature, powered by what some have described as the alchemy of photosynthesis. Practically overnight, barren plants and trees have exploded hysterically into a thousand or more shades of green. Considered the medieval precursor to modern-day scientists, alchemists attempted to turn base metals such as lead or copper into gold or silver, as well as invent an elixir of life that could confer youth and immortality. Though doomed to failure, such efforts did open the way to the scientific method. For the non-scientists among us, the appearance of spring is a near-miraculous transmutation. But for those educated in the natural sciences, spring is the inevitable result of plant biology. In photosynthesis, green trees and plants use solar energy to transform water, atmospheric carbon dioxide and minerals into organic compounds needed for growth, releasing oxygen in the process. Trees continue to store significant amounts of solid carbon when they are old. Moreover, wood products continue to store carbon throughout their useful lives. Photosynthesis is one of the most researched topics on OFRI's website. You can learn more about it and carbon storage from OFRI's fact sheets and video Forest Fact Breaks. Fresh air. Clean water. Fish and wildlife habitat. Forest products. Stored carbon. The benefits of photosynthesis are so remarkable that if such a system had not existed already, we would have had to invent it. That’s one of the catch phrases of OFRI’s educational advertising now airing in the Portland metropolitan area. See the ad called “Signs” at Learning Resources. In addition to growing timber, Oregon has a reputation for colossal winter storms. In December 2007, the Great Coastal Gale of 2007 whipped across Oregon, Washington and British Columbia with sustained hurricane-force winds topping 130 mph. Gusts toppled trees like toothpicks, taking out power lines and blocking highways. Preceded by snow and frigid temperatures, the tropically affected gale spiked temperatures that melted the snow and resulted in severe flooding. Five people lost their lives in Oregon. Some sources compared the storm’s intensity to that of the Columbus Day Storm, which caused widespread wind damage to the Pacific Northwest in October 1962, and the Willamette Valley Flood of 1996, which produced widespread flooding. A casualty was the 700-year-old Klootchy Creek Giant, once the largest Sitka spruce in the world. Near that location, just west of the junction of Highways 101 and 26, the storm lashed out at private forestland, snapping managed Douglas-fir, hemlock, spruce, alder and western redcedar. Afterward, the forest looked like a gigantic game of pick-up sticks. Since then, the landowner has salvaged the fallen timber and, as required by Oregon law, replanted. It looks a lot better now than it did in December 2007. OFRI helped the landowner install a sign on the storm-ravaged site that tells the story. At the recent Oregon Society of American Foresters meeting on the North Coast, Seaside Mayor Don Larson said the sign really helps to educate coastal visitors about forest management. Forest landowners should consider more such signs. Travelers to Oregon forests want to know that trees are being replanted, and they enjoy watching the trees grow. Welcome to OFRI’s new and improved website, including our blog. Eventually we’ll have to name it, but for now “The Blog” will do. If you’re a regular visitor to Oregonforests.org, you may be surprised at all the changes – and maybe just a little confused. Why did OFRI go to all this trouble? The story began when I joined OFRI in August 2008. I told board members and others that in the future we would need to rely more and more on the Internet to tell the story of Oregon’s forests. OFRI’s website, while good, was lagging behind other sites. Make Oregonforests.org relevant and accessible to the public, especially younger people. Connect the public’s use of forest products with the forests they enjoy. Give answers to common questions about forests and forestry. Ensure that all information is backed by solid science. Maintain a library of publications, but make it searchable and relevant to young audiences. Reach out to audiences using social media, video and interactive content. It was clear that OFRI’s site was not doing the job on public education, and that we were becoming irrelevant. Oregonforests.org is our opportunity to celebrate Oregon’s forests and those who work in the sector. We believe the theme “Where Amazing Grows” will relate better to young people and those who rely on the Internet as their primary source of information. 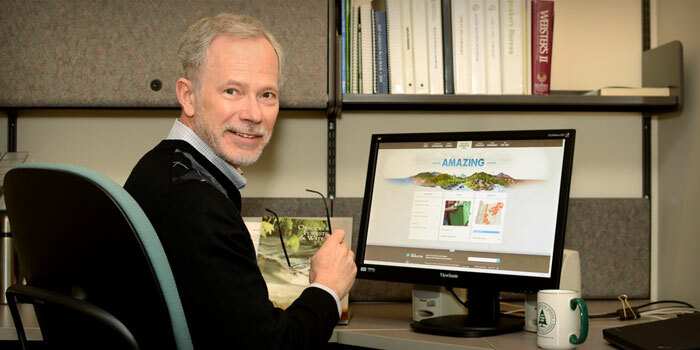 Oregonforests.org is one of three new sites. Simultaneously, we are launching LearnForests.org for K-12 teachers and forestry educators. These folks need easily accessible sources of credible information that align with state standards and benchmarks for math and social science. Later this year, we’ll launch a new site for forest landowners. This is a collaborative effort by the Partnership for Forestry Education, with funding assistance from a federal grant. KnowYourForest.org will effectively deliver information, publications and specialty content used by forest landowners. The Blog isn’t equipped for comments just yet. In the meantime, if you have a comment about our new website, I’d be very interested to hear it. You can always reach me at barnum@ofri.org.